Two Gujarat based scholars, Amita Shah and Itishree Pattnaik, in a recent study, “High Growth Agriculture in Gujarat: An Enquiry into Inclusiveness and Sustainability”, have found that the Gujarat government’s high-profile annual event Krishi Mahotsav, meant to intensify agricultural growth, was high on propaganda, but low in providing help to the marginal sections farmers. Forming part of the new book, “Growth or Development: Which Way is Gujarat Going”, edited by Prof Indira Hirway and others, the study, based on survey of 876 households in 15 Gujarat districts, found that 16.6 per cent of the large farmers benefited from subsidies, as against 8.3 per cent medium farmers, 7.2 per cent small and medium farmers, and just 1.3 per cent of the landless. Large farmers (24.7 per cent) were the main beneficiaries of the new seed variety, as against 14.8 per cent medium and 9.9 small and marginal farmers. 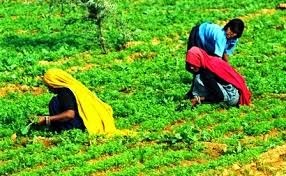 Then, 9.2 per cent got the benefit of better agricultural techniques, as against 2.6 per cent medium farmers and 2.1 per cent small and marginal farmers. Further, while 8.3 per cent large farmers got the benefit of water harvesting, as against 1.3 per cent medium and 1.5 per cent small and marginal farmers. The survey was carried out in Gandhinagar, Mehsana, Ahmedabad, Vadodara, Panchmahals, Bharuch, Dangs, Valsad, Surat, Narmada, Navsari, Tapi, Amreli, Rajkot and Surendranagar districts. While conceding that “irrigated area among the sample farmers increased by 461 hectares during the study period”, there was “a massive expansion of wells (about 5,000) and bore/tube wells (about 2,620) since the beginning of 2000”. But this expansion of the irrigated area was “without corresponding improvement in water use efficiency”, the scholars say, adding, this led to “unsustainable use of groundwater, often through competing extraction of water by farmers in the study villages.” The scholars suggest, only water intensive crops gained.